Amplifies video signal up to 50ft, signal splitting and monitor loop through from a computer to your InFocus projector. 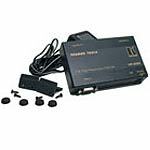 Includes distribution amplifier and power supply rated for 110 volts. Provides signal amplification up to 50ft, signal splitting and monitor loop. Power supply rated for 110v. We have no downloads available for the InFocus Distribution Amp/VGA Signal Splitter by Kramer at this time.